How did the Nazis use culture and the mass media to control the people? Propaganda posters. Click on the image below and put a copy in a Word document. For each of the posters explain the meaning and purpose of each of the images in turn. In addition you may wish to add images from the BBC collection or the Calvin 'German Propaganda Archive). 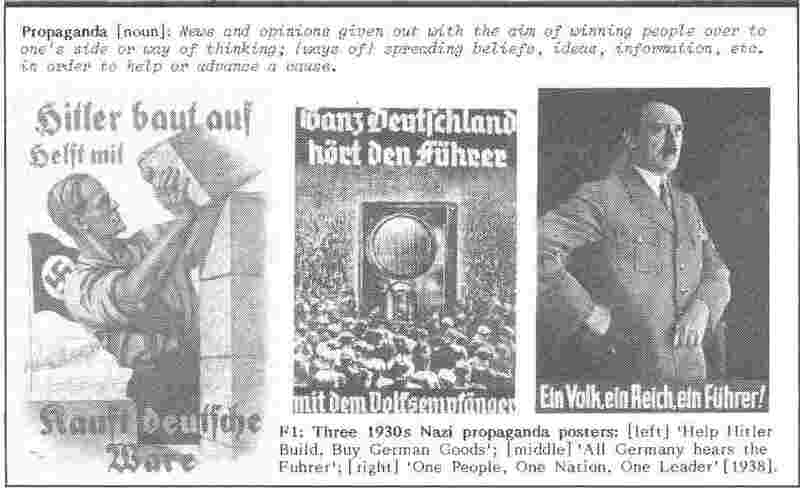 See a close up of the three propaganda images. See this excellent propaganda section of the BBC History website. Includes an article by David Welsh. Complete the 'Persuasion' section of your Coercion, Persuasion and Consent diagram. Make sure you explain and distinguish between Propaganda and Censorship. You will probably need to use a small font to include all the relevant examples. Brooman (100-103) and Grey and Little (44-45) have plenty of examples to include: the press, culture, literature, music, radio, cinema, rallies, misinformation, restrictions (censorship) and school books. Nazi Cinema. A group work activity involving drama, music, art, English, website design and video editing. Activity and introductory sheet. Other resources. Additional extension questions to be considered after you have made your film. Remember all attempted extension work (satisfactory and complete) is awarded a merit. When everything is completed have a go at this interesting activity from the American PBS Culture Shock website.